Natural materials such as hardwood are repeated in built-in furniture, deck and cladding. The valuable car space was disguised with subtle tricks such as a small change in level and a planter. Careful planning entailed reorienting the layout of the house. This increased the usability and flow of movement through the space. The poorly located bathroom at the back of the house was moved into the centre, and the kitchen expanded to the boundary, leaving a small courtyard in the middle of the house. 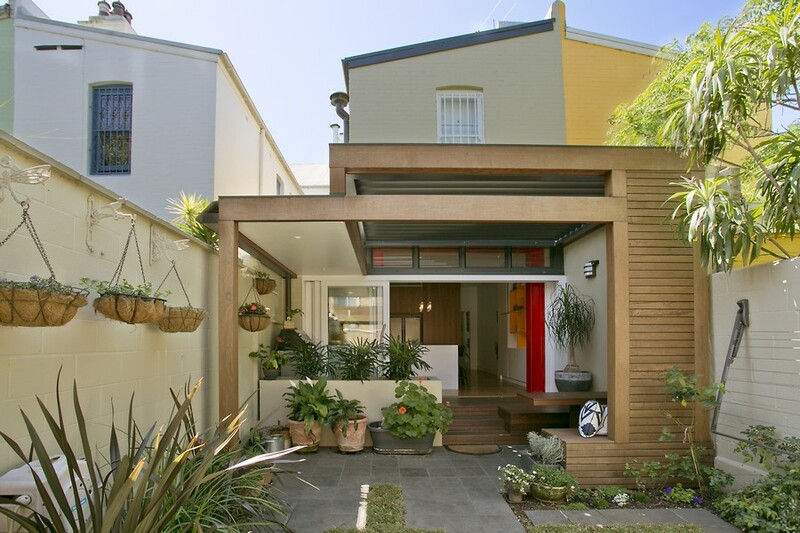 An innovative outdoor room was created between the kitchen and courtyard, using a hardwood structure and motor operated louvers which close to form a roof when it rains. As with all our projects, special attention was paid to updating the technological systems in the house, such as lighting, power, switching, audio, back to base alarm, state of the art kitchen hardware and appliances. All of our projects are carefully specified so that hardware is good quality, works beautifully and lasts for 50 years instead of falling apart in two. A state of the art commercial kitchen was designed to be the new heart of the house and the exposed steel portal frame is celebrated by the use of the colour red.